By Xah Lee. Date: 2005-12-26 . Last updated: 2019-01-29 . 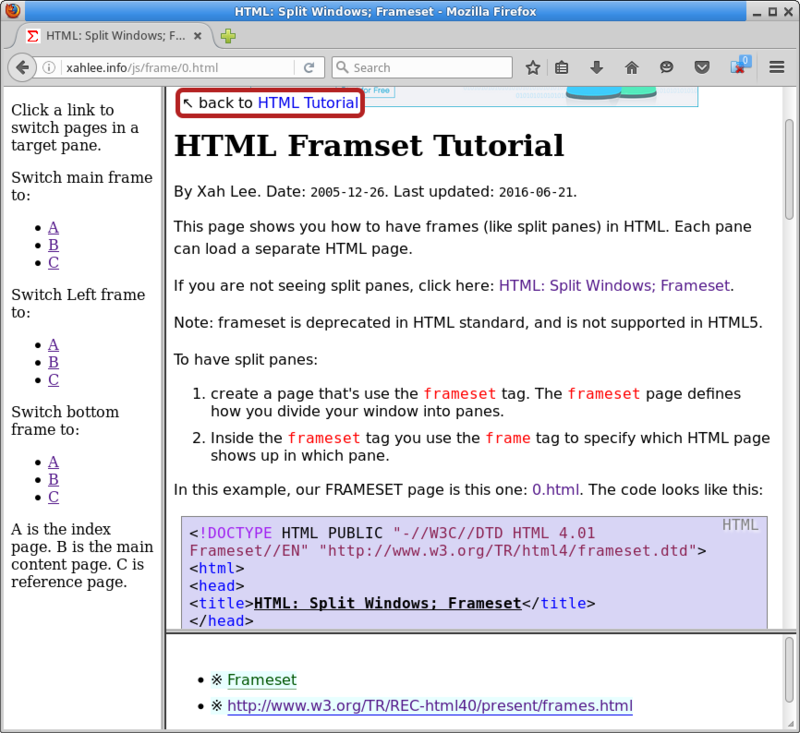 This page shows you how to have frames (like split panes) in HTML. Each pane can load a separate HTML page. If you are not seeing split panes, click here: HTML: Split Windows; Frameset. Note: frameset is deprecated in HTML5. However, it's still supported by browsers, and likely will be forever for backward compatibility, and it is part of the HTML 4.01 Frameset standard. Here's a example of split panes. Create a page with the following content. The first line: <!DOCTYPE HTML PUBLIC "-//W3C//DTD HTML 4.01 Frameset//EN" "http://www.w3.org/TR/html4/frameset.dtd"> is important. To use frameset, you need to use this doctype. The line <frameset cols="20%,80%"> means the window is to be divided into 2 columns, left column is 20% width and the right 80% width. The line <frame name="lefty" src="a.html"> specifies that “a.html” is the page that should go to the first column. The overall effect is splitting the window into 3 panes. A left pane, and a right top and bottom panes. In the “frame” tag, it has a “name” attribute. So, we named our 3 panes as “lefty”, “topy”, “bottomly”. The purpose of name is that when we do a link we can specify which pane the linked page should show up. a.html is for Table Of Contents. b.html is this page you are reading. Click here to remove all frames: HTML Tutorial. Now, just for fun, click on 0.html and witness infinity!